Comments: The Traveler's Rest was a wood-framed hotel built about 1909 by Jacinto V. Pereira, who was also the President of Fidelity Nationial Bank on Valley Street. 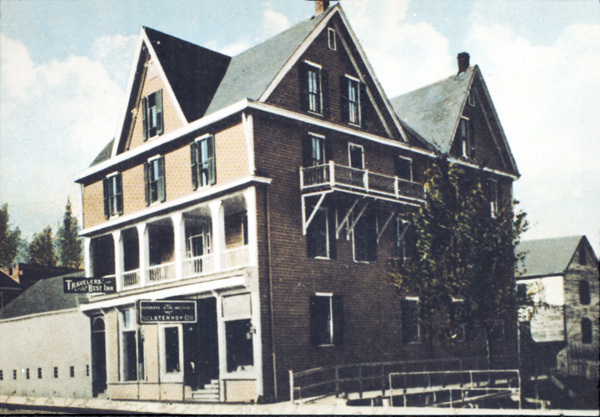 The leading hotel in Scottsville for 67 years, the Traveler's Rest contained nineteen hotel rooms with two bathrooms on each floor. The dining room sat approximately sixty people at tables covered by white tablecloths and provided 'family style' service. Its kitchen produced great home-cooked meals and was a favorite with locals and travelers' alike. The dining room even served school children at lunchtime when there was no cafeteria at Scottsville School. The kitchen staff also packed box lunches for passenger trains stopping at Scottsville Depot. A circa 1920 newspaper article delightfully described the hotel's weekend dining room activity as follows: "I spent a Sunday at Scottsville's leading hotel. There the townspeople came to dine after the morning church service. Elderly ladies, with delicate complexions and blue eyes, gowned in organdy and voile, were among the guests. Though they were reaching the age of silvering hair and lace fans, they addressed each other by first names. Men wearing white vests and winged collards did the same. That was evidence of friendships tracing back to earliest remembered days." The top three floors contained the hotel area and was accessed by an enclosed stairway on the west end of the building. The building's lower floor contained a hardware store, which was initially operated by Nathan and Wirt Sclater, and later by George Omohundro. According to Irene Dorrier whose father worked in the hardware store, the Traveler's Rest "had not a ninety degree angle inside the building which created wonderful corners and backrooms." In the days of horses and buggies, traveling salesmen could rent their transportation at the livery next door at the corner of Main and Valley Streets. Later a filling station replaced the livery as travelers and salesmen alike traveled by automobiles. Between 1950-1962, Virginia Lumpkin operated the hotel, and later the hotel was converted to apartments. A disastrous fire consumed this hotel in February 1976, burning it to the ground along with its adjoining filling station. Shown below are two photos of the Traveler's Rest hotel as seen from the intersection of Valley Street (left) and Main Street (right). The upper photo was taken about 1910 and shows the livery occupying the lot just west of the hotel. The bottom photo was taken in 1953 and shows the Esso Station, run by Gene Johnson, occupying the lot west of the hotel. In 1953, Omohundro Hardware Co. occupied the bottom floor of the Traveler's Rest. The top photo is part of the Virginia Lumpkin collection. Virginia resides in Scottsville, Virginia. The bottom photos are part of the Robert L. Goldstone collection; they were included in Robert's Master of Arts thesis at the University of Virginia which was entitled Historical Geography of Scottsville, Virginia (August 1953).